An 18-year-old nulliparous woman presented with a history of right-breast tenderness and a palpable mass in the lower inner quadrant. She first noted the lump four to five years previously, and it was stable in size. She described herself as a healthy, active non-smoker. She was not using any form of hormonal contraception or other medication. There was no family history of breast cancer. She was first seen in our clinic one year before eventual surgical excision of the mass. Examination revealed a clinically benign mass, 30 x 20 mm in size, in the lower inner quadrant of the right breast. The mass was mobile, well-defined and not fixed to surrounding breast tissue and consistent with a fibroadenoma. Axillary examination was normal. An ultrasound supported the clinical findings of a benign lesion in the lower inner quadrant. In addition to the clinically palpable mass, a second retro-areolar lesion was found on ultrasound. The largest lesion measured 43 x 24.5mm and appeared multilobulated. The retro-areolar lesion measured 30.8 x 13.5 mm with a similar appearance. No intralesional vascularity or calcifications were reported. The patient was advised to undergo follow-up examinations to assess for interval change, in line with current unit protocol. At the next consultation six months later, the largest lump showed an increase in size with minor pain. Clinical examination revealed that the lump now measured 50 x 50 mm, but still had the characteristics of a benign breast lump. Surgery was advised because the lump increased in size and she underwent simple day case surgery, with no complications. Both lesions were submitted to the Division of Anatomical Pathology for macroscopic and microscopic examination. Macroscopically, two fibrous nodules were received. The smaller nodule measured 40 x 30 x 28 mm and weighed 25.6 g. The larger nodule measured 55 x 48 x 23 mm and weighed 32.7 g. Microscopic examination of the smaller nodule showed a well-circumscribed, benign fibroepithelial lesion. A proliferative, cellular fibrous stroma was present around compressed ducts with an intracanalicular growth pattern. There was no evidence of malignancy and a diagnosis of juvenile fibroadenoma was favoured. The larger nodule, corresponding to the mass which had lately increased in size, showed mostly similar histological findings as compared to the smaller nodule. Sections showed a well-circumscribed, encapsulated biphasic lesion composed of compressed ducts with surrounding cellular fibrous stroma. However, focal ducts were expanded by an atypical proliferation of small, monomorphic luminal epithelial cells. A vague cribriform architecture was noted in these ducts. There was no intraductal necrosis present and there was no evidence of invasive malignancy. This focus measured 5 x 2.5 mm. Immunohistochemical (IHC) staining for CK5/6 showed no staining within the atypical epithelial proliferation, while ER staining demonstrated diffuse nuclear positivity of the atypical cells. 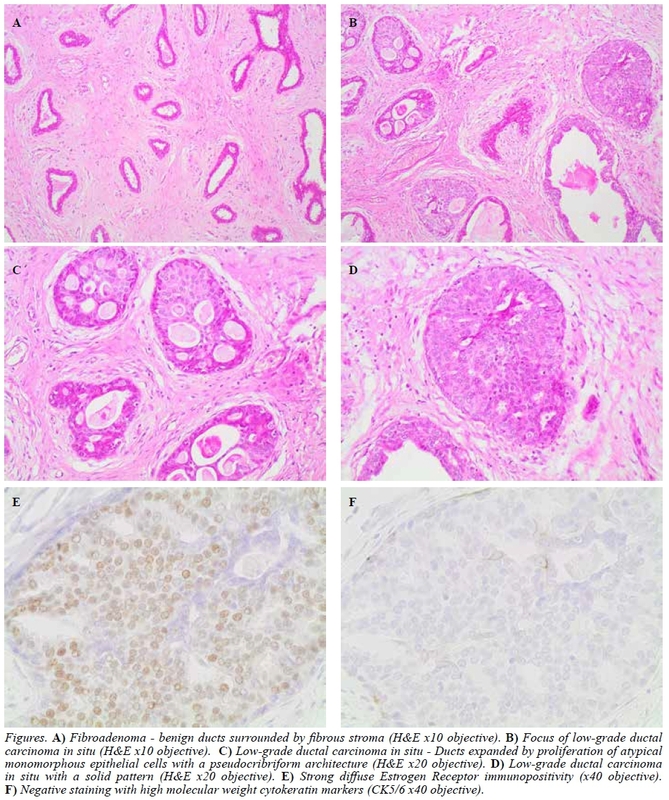 The sample showed an Allred score of eight out of eight.8 In view of the morphologic features and IHC staining pattern, this proliferation was best classified as a focus of low-grade DCIS arising within a fibroadenoma. The closest surgical resection margin was 7.3 mm. The patient scored seven out of 12 according to the University of Southern California/Van Nuys Prognostic Index (USC/VNPI) (1 for size, 1 for grade, 3 for age and 2 for margins). Her surgical margins were clear and the decision was made not to do any further surgery or treat her with radiotherapy. After tumour board review, we decided not to offer her tamoxifen and rather obtain baseline magnetic resonance imaging (MRI) of her breast and to follow her up as a high-risk patient with yearly imaging studies and six monthly clinical breast examination. There is no established care protocol for the management of fibroadenomas in teenagers. There is growing evidence that core biopsy is not routinely required in the adolescent as it is unlikely to affect patient management. In a retrospective study of 357 patients aged 25 years or less with a breast mass consistent with fibroadenoma (clinically and on ultrasound), 78.7% were histologically confirmed and 21.0% had another benign mass or normal histopathology (of whom 0.8% had a benign phyllodes tumour). Only 0.3% had breast carcinoma and retrospective review of the breast images did confirm an ill-defined mass suspicious for malignancy.11 There is a risk of iatrogenic injury in the developing breast and this may outweigh the benefits of surgery. The iatrogenic risk is especially relevant when the risk of malignancy is low and fibroadenomas often resolve over time.12 At the Groote Schuur breast unit we follow up young patients (< 25 years), after the initial diagnosis of a fibroadenoma, based on clinical examination and ultrasound. Only large or atypical fibroadenomas either on clinical examination or ultrasound will receive a core biopsy to confirm the diagnosis. Patients with a giant fibroadenoma (> 5 cm) will be offered surgical removal of the lump. In 2008, the National Comprehensive Cancer Network (NCCN) recommended excision alone as an acceptable treatment alternative for patients with DCIS.13 The clinical dilemma remains in deciding which group of patients need added radiotherapy. This dilemma is even more appropriate in a teenager with DCIS given the long-term side effects of radiotherapy. Multivariate analysis has shown that certain factors are independent predictors of local recurrence in patients with DCIS treated with breast conservation. Van Nuys Classification predicts local recurrence using a combination of nuclear grade and necrosis.14 The Van Nuys Prognostic Index (VNPI) added size and margin width in 1996 and the USC/VNPI added age at diagnosis to the algorithm in 2002.15,16 The USC/VNPI was further fine-tuned in 2010, by including different treatment recommendations for patients with margins between 3-10 mm if their USC/VNPI falls between 7-9.17 The European Society of Breast Cancer Specialists (EUSOMA) guidelines suggest that an acceptable rate of in-breast recurrence is 1-2% per year.18 Using this standard, the recommended management for individuals, which include our patient who scores 7 with margins more or equal to 3 mm on the fine-tuned USC/VNPI, is excision alone without radiotherapy. Current National Comprehensive Cancer Network (NCCN) guidelines recommend ER testing for DCIS patients and consideration of tamoxifen for women with ER positive disease or who undergo breast-conserving surgery (BCS) without radiation.13 This is done to prevent the rate of recurrence because no mortality benefit for tamoxifen after DCIS has been conclusively demonstrated.19 There is no literature published documenting the long-term safety of tamoxifen if started in such a young patient. Based on this evidence as well as the expected side effects of tamoxifen, we decided not to use tamoxifen as a risk reducing medication in our patient. The literature contains several reports describing patients with BcaFad, which is a very rare diagnosis. Our patient presented with the very unusual combination of DCIS arising within a fibroadenoma at the young age of 18 years. Consequently, this case challenges the current risk evaluation and management in young women diagnosed with a fibroadenoma and demonstrates why all breast masses, regardless of the patient's age, should be treated with suspicion and excised if any atypical features or rapid increase in size are present. Breast cancer in teenagers is an extremely rare event and we would not recommend change in management protocols based on this one case.